Preheat oven to 375º F. Cream the shortening and the sugar in a large bowl. In a small dish, mix the flaxseed and the water and whip with a fork until the mixture thickens to the consistency of an egg, then add it to the shortening/sugar mix. Add in the milk, molasses, and vanilla. Mix well. Finally, add in all the rest of the dry ingredients and mix them in evenly. 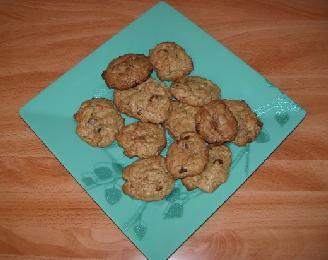 Drop by rounded spoonfuls onto a cookie sheet and bake for 10 to 15 minutes until just brown. Note: Obviously this can be made without the vegan substitutions; you can use butter for shortening, an egg instead of the water and flaxseed, real milk instead of soy, and regular chocolate chips instead of vegan ones. However, you might as well just use a chocolate chip oatmeal cookie recipe that's designed to be non-vegan if you're going to do that. Yield: About 2 1/2 dozen small cookies.